In the oddly named 'Swap Shop' in Worthing I turned down the opportunity to snap up what was probably someone's life long collection of novelty kitchen timers. 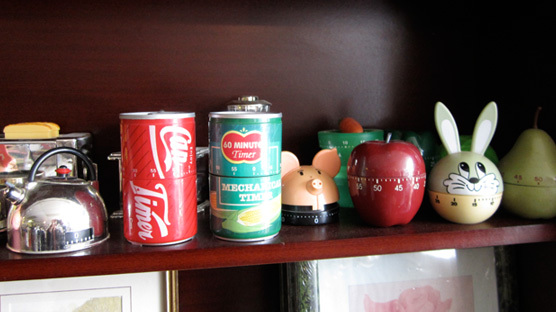 The collection of kitchen timers included a bunny, kettle, toaster, pear, apple, pig, can of coke, can of sweetcorn, carrot, juicer, egg, red pepper, lemon, bar of chocolate and more. Why didn’t I buy them? I think I was peeved that I couldn’t swap something of mine for them – why call yourself Swap Shop if you only sell stuff? This has kind of got me thinking about adding a Swap Shop section to Thrift-ola. What do you think? I’m about to write up my Thrift-ola trip to the Sussex coast and will include all info on places to Thrift! Waowsers! I’m so sad you didn’t get to do a swaperoo for the kitchen timers collection. They’re amazing. I’m super excited about the Thriftola ‘Swap Shop’ section. Yes, yes. Sounds grrrrreat. Oh yes – Swaparama a go-go!!!! Gonna be the raincloud drizzling all over swapping, but I’ve always found it to be heartache…either I see something amazing but have nothing ‘worth’ the same to swap or the complete opposite happens. I like to swap things for my cold hard cash!